The rumors abound. Did Keith Richards really receive a blood transfusion before jumping on a Swiss stage in 1973? Did Van Halen really insist that all brown M&Ms be removed from their backstage bowl? Did Guns & Roses honestly request a hot tub filled with models? Perhaps no locale is more mysterious than backstage at a rock concert. But those who where there adhere to a rock-n-roll code of sorts, rarely sharing the details of the incidents that took place. Until now. Pittsburghers will get their chance to experience what really happens backstage on Friday, June 12th, when the Mattress Factory presents ALL ACCESS: The 2009 Urban Garden Party. Co-Chairs for the event are Rich and Cindy Engler, who are responsible for producing more than 5,000 concerts and events, and some of Pittsburgh’s most memorable concert experiences throughout the past 35 years. Each year, the Urban Garden Party becomes the talk of the town as more than 1,000 attendees turn out to help support the museum’s mission in a festive, celebratory atmosphere. As our primary annual fund raising event, the Garden Party is vital to the museum’s programming and has helped us push the artistic envelope for more than three decades. 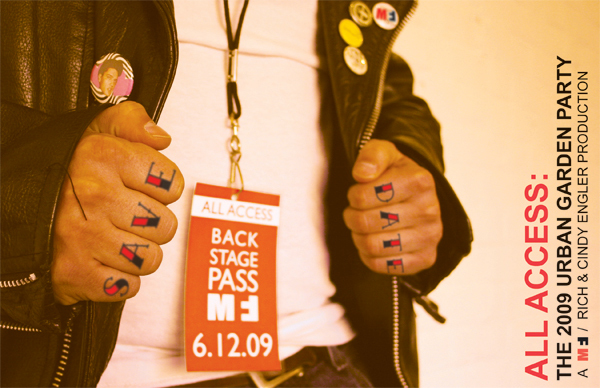 ALL ACCESS: The 2009 Urban Garden Party will take place from 7:00 PM to 11:00 PM on Friday, June 12. A VIP Pre-Party, hosted by Bob Sendall of All in Good Taste Productions, will begin at 6:00 PM. PS: Check out photos from last year's Garden Party HERE. 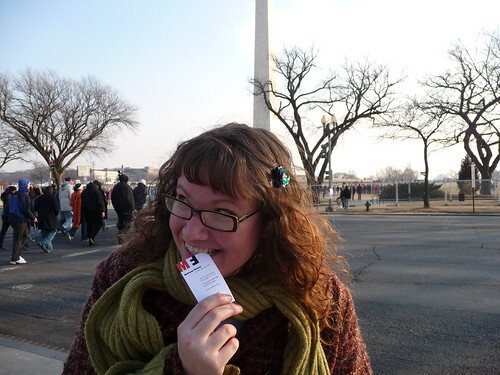 The M to the F to the D to the C.
Mattress Factory Membership Director Lindsay O'Leary is reppin' the MF in DC for Inauguration 2009. 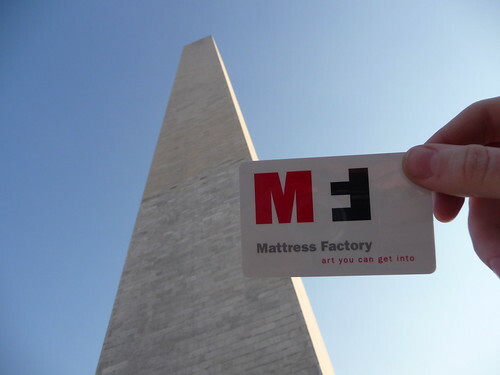 Are you in DC for the Inauguration? Have MF swag on your person? Send us a pic and we'll post it here. PopCity's first in a series of videos on Young Creatives features artist Jacob Ciocci. Jacob (along with his sister Jessica) are currently exhibiting in PREDRIVE: After Technology. A big thanks to PopCity and Ben at Ambulantic for putting this together. Making Art With The Whole Family. It seems like just yesterday that we were having our Community Art Lab reception showcasing and celebrating the wonderful artworks created by North Side youth this past summer. Based on the feedback we received from a number of parents whose children participated in that program, we've decided to present a series of family workshops during the winter months. It might just be the perfect thing to do to get the whole family out of the house just as cabin fever begins to set in! More information about the two upcoming Family Workshops is below. Find out what Diaristic Art-Making is all about and how you can start your own diaristic practice with your family. Enjoy "behind the scenes" details of Mary Temple's installation, Untitled, and learn about other artists (including families) who have diaristic art-making practices. Then, get creative by making a collaborative artwork with the group and plans for your own family diaristic practice. Diaristic Art Making is a process accessible to everyone. All you need to do is decide on an idea, the information you want to collect to make a physical record of the idea, and how you will organize and present your information. TRY IT! This workshop promises to provide lots of hands on ideas to get you started. This workshop begins with a tour of the current exhibit PREDRIVE: After Technology by artist, Gretchen Skogerson. She’ll talk about the ways each PREDRIVE artist used time, controlled light and harnessed darkness in their pieces. We'll learn more about the use of black light in her work by making a piece from a selection of materials that glow under black light. 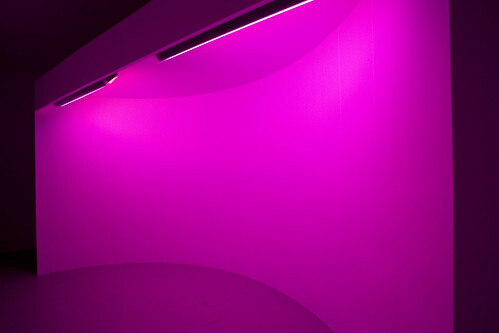 We'll also create individual pieces to form a larger piece and decide how it changes in incandescent light, black light and darkness. If you are interested in attending one or both of the family workshops please give us a call to reserve your family’s space (412.231.3169) or email us. Happy New Year and I hope to see you (and your family) soon! Nina Simon over at Museum 2.0 recently sparked some passionate dialogue with a blog post about how some museums and cultural institutions are using Twitter. Glad to hear people are digging the way we do it. Per Nina's request, I've uploaded a template to help you create your own customized Twitter background. We all have varying skill levels when it comes to graphic design, so I'll try to make this as simple as possible. When creating your image in InDesign or Photoshop, set the dimensions of the document to 2048 pixels wide by 800 pixels tall. This size will accommodate most browsers and screen resolutions. Next, place this image into the document. The gray area is live. 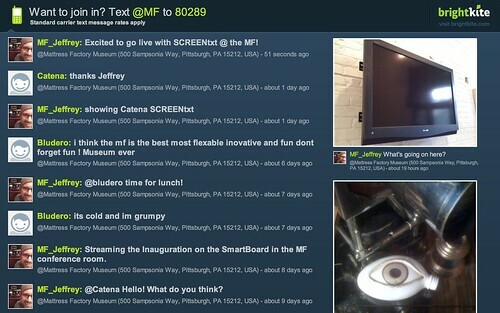 A logo or bio placed anywhere in the 216 x 495 gray area on the left side will be visible alongside your Twitter stream. The masthead gray area (81 pixels high) stretching the length of the document is an optional design element. On our profile, it's the black bar running along the top. Steer clear of the white area. When you have an image you're happy with, delete the template layer. Save your image as a .jpg and upload it to Twitter via the Settings menu. Click Design, then Change Background Image. Choose the file you just created from the Browser and click Save Changes. That's really all there is to it, although you may have to tweak your Twitter design colors a bit.